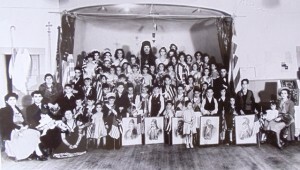 In the 1940s, McGill, Nevada, a small town in the eastern part of the state, was home for over 100 Greek families. Dorothy (Theodora) Haskell tells the story of growing up in McGill and eventually settling in Seattle, Washington. 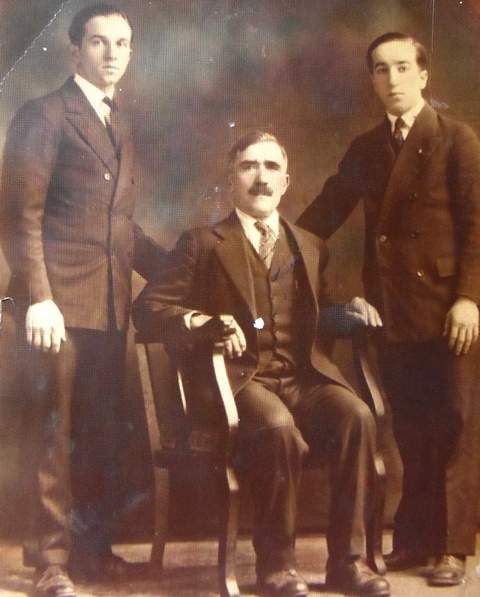 Dorothy’s papou (grandfather) Demetrios Assuras was born in 1864 in Bosnia, (later changed to Pelagos) outside of Tripoli, Greece. The family had a farm in Pelagos where they grew grapes and vegetables. He had to leave Greece because he was involved in a dispute where a man was killed after two families had feuded for years. 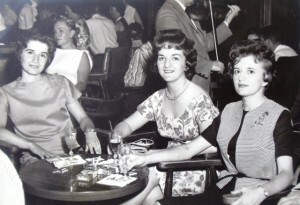 When Dorothy went to Greece the first time in 1966, her relatives would not let her go anywhere by herself as the vendetta was still in effect. It was not until her later trip to Greece in 1985 that the vendetta was over as the last of the other family had died. 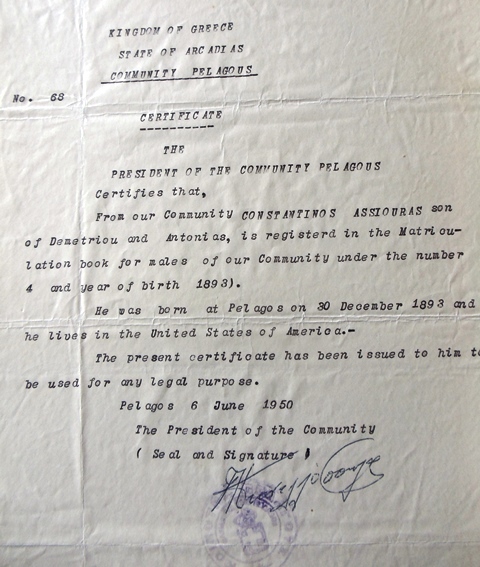 Demetrios’ son, Constantinos Assuras, was born on December 30, 1892, in Pelagos. Constantinos left the village and sailed from Piraeus on the vessel MACADONIAN and landed at Ellis Island on June 2, 1912. His daughter Vasho remained in Greece, married and operated the farm. Another daughter, Nicole, died of typhoid fever. 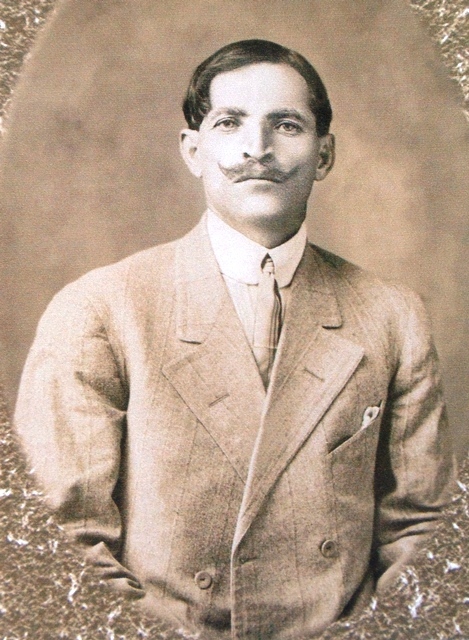 Constantinos met his father in Chicago, Illinois, where they operated a store. They then left Chicago and settled in San Francisco, California. 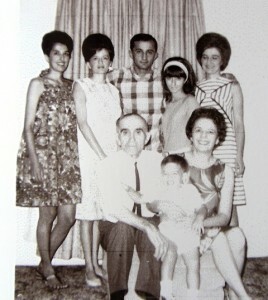 Demetrios later sent for his family one at a time. 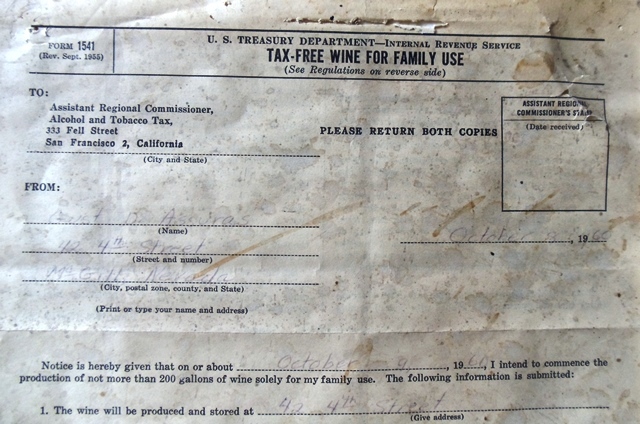 When the Great Depression began, Demetrios heard about employment in the mines of eastern Nevada and moved to McGill with his wife Andonia and their sons, Constantinos and John. Because he was bilingual, he became a foreman for the Kennecott Copper Company. Most of his crew was also Greek. 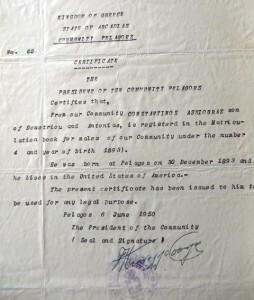 Despite his position, Demetrios was not paid foreman wages because he was a foreigner. 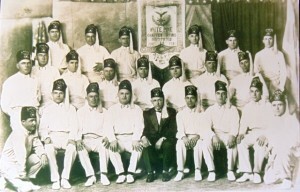 The three small towns, McGill, Ruth and Ely, Nevada, are not far from the larger Greek Community in Salt Lake City, Utah, yet had a population of over 100 families and two Greek Orthodox churches, St. Barbara in McGill and St Alexis in Ely. 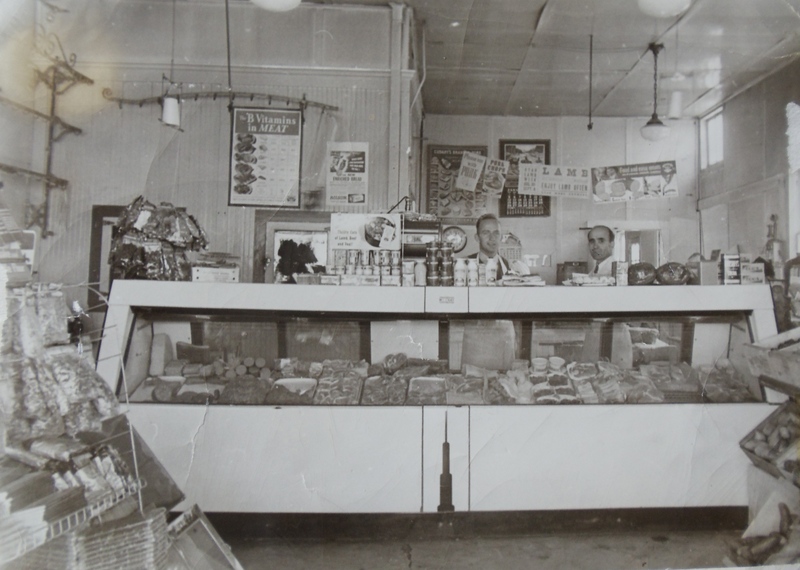 Demetrios and Constantinos purchased a bakery, then a grocery store and meat market in McGill. Then they purchased two cattle ranches. In those days they could raise, slaughter and sell the beef. One ranch had 2000 acres and was later sold. The smaller ranch has hot springs and was to be developed as a resort and is still owned by the family. 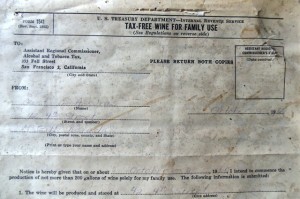 Unfortunately, those plans were halted with the onset of the Great Depression. 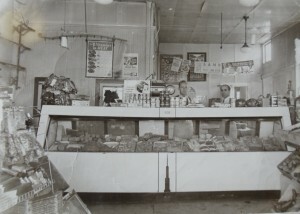 Constantinos continued to operate the store while a foreman was hired to run the ranch. He would often speak with pride of his patrida (homeland) but also how he left because of the poor economic conditions there. Dorothy was surprised on her first trip to Greece in the 1960s when she saw how poor the country was. Despite the primitive conditions she experienced, she quickly became accustomed to the simpler life style and hospitality she received. Dorothy’s mother, Christina (Christine) Louras, was born in Bingham, Utah, on February 24, 1916. Her parents, Costa and Theodora Louras, both came from Levidi, in Central Greece. The y had sheep and grazed them in Idaho but lost the flock during the Great Depression. They then moved to Bingham to work for Kennecott Copper. Christina’s marriage to Constantinos was a proxenia (arranged), as was common practice at the time. They were married on January 20, 1933, in the Greek Orthodox Church in Salt Lake City. She was much younger than him. (Grooms were expected to be stable and able to support a family.) Dorothy describes her mother as a small woman, an excellent cook, and very active in her church. Christine was president of her Philoptochos (women’s auxiliary) and Constantinos was president of the McGill Greek community. 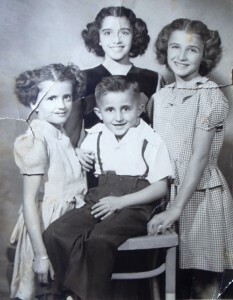 Of the five Assuras children, all born in McGill, Antonia (Annette) is the oldest, born on November 1, 1935, and now lives in Sacramento, California. The second child, Janene, born January 29, 1937, passed away in 2005. Dorothy was next, born on January 24, 1939. The only son, Demetrios, was born on March 29, 1942, and lives in Connecticut. The youngest daughter, Cassandra “Cassie,” was born on May 30, 1947, and died in 1996. Dorothy praises her father for his quest for education for his children, all of whom attended university. 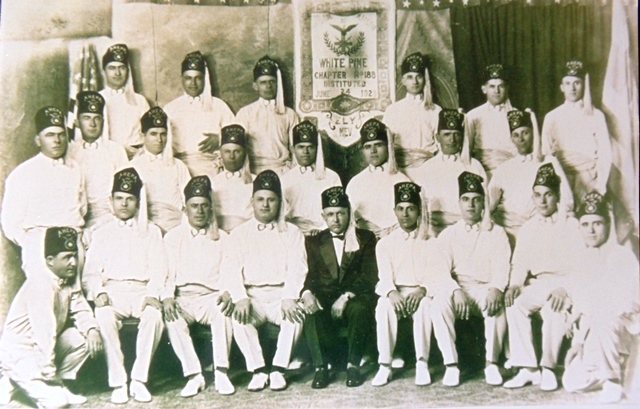 The Assuras family lived in what was called Greek Town, run by the Kennecott Copper Company. 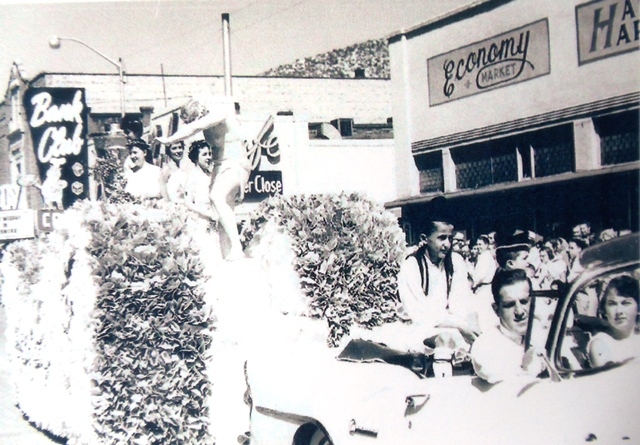 They, along with other immigrants (Italians, Slavs and other Europeans) lived “all below Main Street,” the segregated area of town, and were even called “dirty Greeks.” Dorothy’s early years were very involved with the church, singing in the choir and attending Greek school. 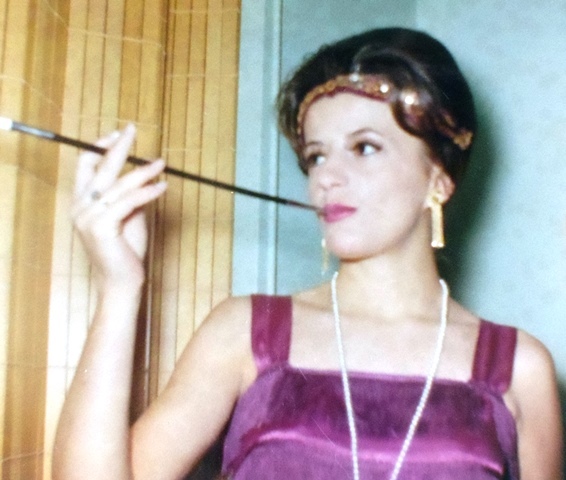 All of her friends were Greek and it was all Greek at home, especially with her papou (grandfather) Demetrios and yiayia (grandmother) Andonia living with them. 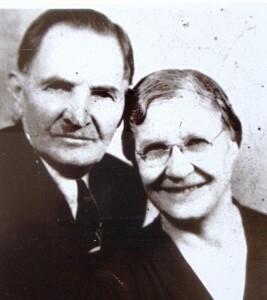 After they died in 1943 and 1945 respectively, her maternal grandparents, Costa and Theodora, moved in until they passed away in 1953 and 1954. 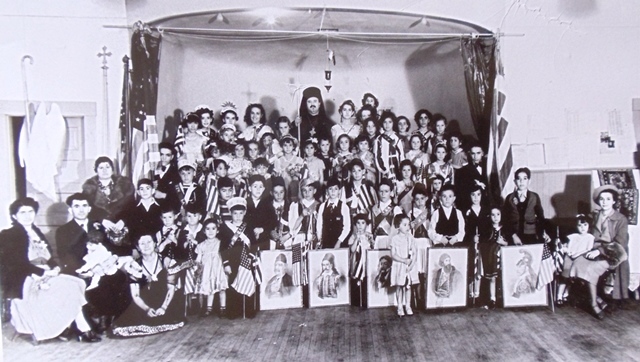 For Dorothy, McGill was a “terrific small town.” When she began kindergarten and would mix her Greek and English, the teacher said “speak English Dorothy, speak English.” She attended high school in nearby Ely with other children from all three towns. She did well in school, belonged to the glee club, was a cheerleader with the girls club called “The Peppers” and was homecoming queen. She remembers that the Greeks really stuck together within the larger Mormon population. The Mormons knew nothing about Greeks or their culture (they were just foreigners), and there were efforts to convert them to Mormonism. Dorothy attended college at Holy Cross, a private women’s school in Salt Lake City where she studied to become a registered nurse. She first worked at Holy Cross Hospital in Salt Lake City until she passed the state nursing examinations. With her nursing credentials transferable to other states and an adventurous spirit, she moved to Reno, Nevada, in part “to get away from the Mormons” and worked at the Washoe Medical Center (changed to Renown Health in 2006). From there she moved to San Francisco, California, and worked in the General Hospital’s emergency room. It was the 1960s and Dorothy loved the active, fast-paced work and her life in San Francisco. When the Vietnam War began, and with her sister Demetra working for a senator in Washington D.C., Dorothy followed Demetra and worked at Walter Reed Hospital. She enjoyed the busy activity of the emergency room and intensive care units where the injured soldiers began arriving from the war. At the same time, her brother Demetrios was serving in the United States Marine Corps and was stationed in Newberg, North Carolina. While Dorothy and her sister were visiting Demetrios, he introduced her to his commanding officer, Gene Tevit. 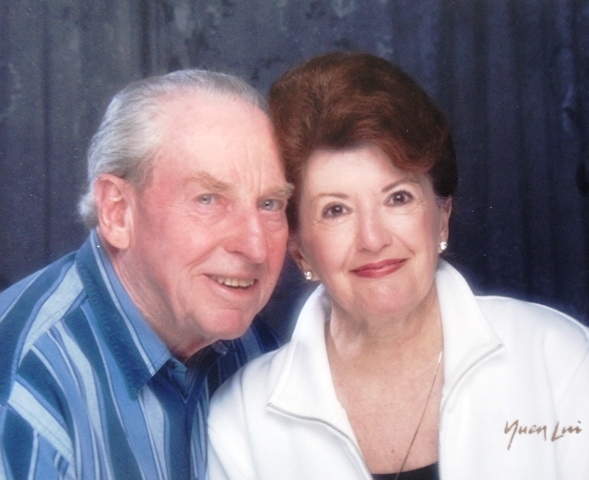 Gene had served two tours of duty as a helicopter pilot and worked as a pilot for Northwest Orient Airlines. 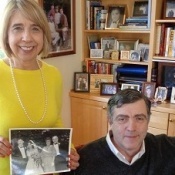 The relationship was reluctantly approved by her family primarily because Demetrios had made the introduction and because Dorothy’s father, Constantinos, had “loosened up and become more Americanized.” Gene would fly from Newberg to see her and they were married on November 22, 1966. Gene and Dorothy have two sons, Michael (1968) and Daniel (1969), both born in Seattle, where the couple had moved for his work with the airline. 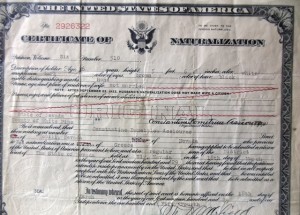 In 1974, the family was transferred to Northwest Orient headquarters in Minneapolis, Minnesota. They lived in nearby St. Paul, Minnesota, where Dorothy quickly made contact with St. George Greek Orthodox Church. There she met Fr. John Angelis who later became her priest in Seattle and developed a friendship with Mel and Theodora Geokezas (see BRINGING THE COOKING BACK HOME). It was also in St. Paul where Dorothy and Gene were divorced and she moved to Reno to be closer to her parents. With two young sons, Dorothy “did what she had to do” and returned to work at Washoe Medical Center. Fortunately, her mother, now a widower, moved in and was able to help with the children. 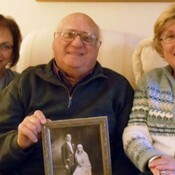 Dave Haskell had been Dorothy’s neighbor for several years and was adored by her family. Thus it was easy for Dorothy to let him into her life and they were married in 1982. He was chief engineer with American President Lines which sailed out of Seattle. They moved to the Woodinville area northeast of Seattle where Dorothy’s sister, Cassie, had previously settled. Dave loved anything Greek: food, traditions and the closeness of family. They were married in the Greek Orthodox Church. 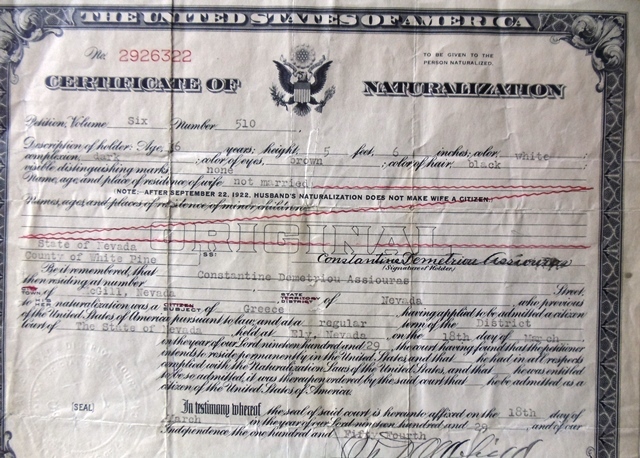 Dorothy was able to travel with him on the ship and their stops included Hong Kong, Singapore, Japan, China, Korea, United Arab Emirates, Sri Lanka and India. 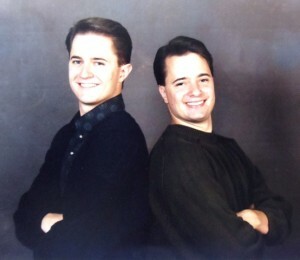 They shared the good life until Dave passed away in 2014. As the Church had always been an important part of her life she “couldn’t not go to church.” When she moved to a new area, she attended the Greek Orthodox Church and always found herself among friends. At St. Demetrios in Seattle she has served as president and treasurer of Philoptochos and has served on its national board. She has also served on the Camp Agape board (a program for Kids ‘n Cancer). She presently coordinates the purchase and collection of food for Northwest Harvest, with the help of a $150 monthly contribution from Philoptochos. She believes that this wonderful organization is not fully appreciated as many know little of its philanthropic work. 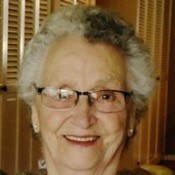 Dorothy is proud of her heritage and the independent spirit which she embodies. 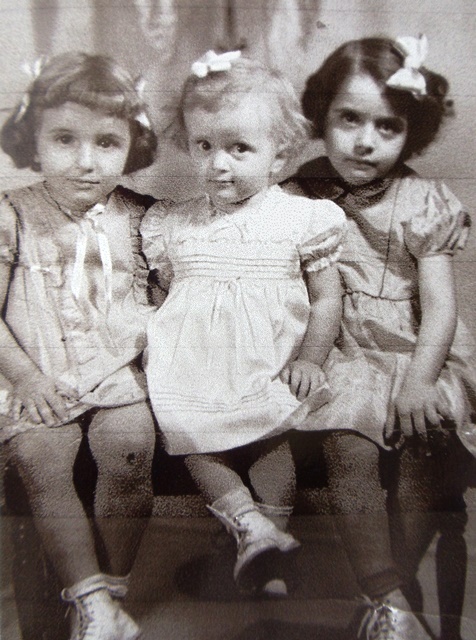 As her Greek heritage and Orthodox faith are tightly interwoven, she remembers being surprised when a mother brought her children to Greek school and Dorothy learned the mother was of a fundamentalist Christian faith. 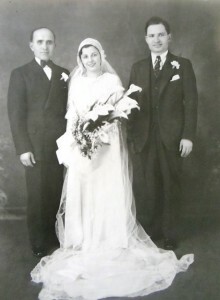 While her sons, Michael and Daniel, reluctantly attended Greek school, they have maintained their contact with and were both married at St. Demetrios. She now has four grandchildren, two from Michael and two from Daniel. 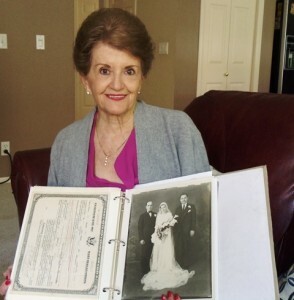 Dorothy’s blond, blue-eyed granddaughter identifies herself as Greek and Dorothy has made her grandchildren promise they would be married in the Greek Orthodox Church. Had her ancestors not come to the United States, Dorothy knows she would have lived a very poor life in Greece. She values the support and strong moral background her parents provided. Also, there were always unrelated theos and theas (uncles and aunts) around to provide the support of an extended family. She remembers “tha fas xilo” (the threat of being hit with a stick) if she didn’t behave and being told not to do anything she wouldn’t do if her mother was watching. 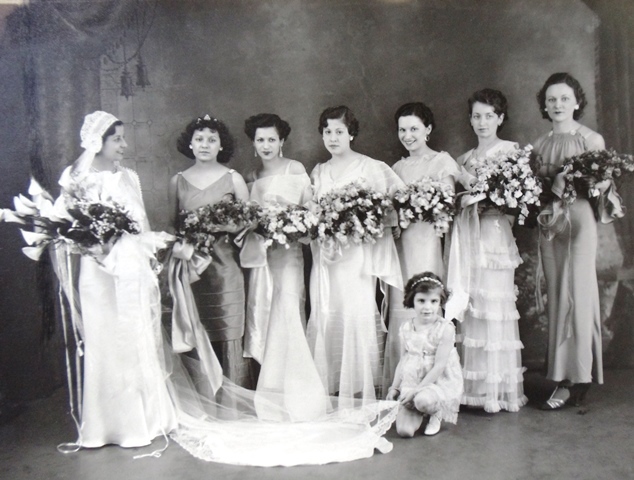 Echi O TheosDuring World War II in Greece, Maria Cooper (nee Deligianni) was unable to pursue her schooling. Rather, as a teenager and the oldest of seven children, she was responsible for her younger siblings.